"Some simple modifications can make this delicious soup even healthier! I reduce the sodium by using low-sodium chicken broth and fresh chilies instead of canned. Also, using vegetable cooking spray instead of oil helps reduce the fat content. Adding some tasty fresh toppings helps my family get more vitamins. I also reduce fat by using boneless, skinless chicken breasts." Place chicken, tomatoes, enchilada sauce, onion, banana peppers, and garlic into slow cooker. Pour in water and chicken broth. Season with cumin, chili powder, salt, ground pepper, and bay leaf. Stir in corn and cilantro. Cover and cook on Low for 6 to 8 hours, or on High for 3 to 4 hours. Bake in preheated oven until crisp, 10 to 15 minutes. Sprinkle tortilla strips over soup. Suggested toppings: sliced radishes, diced avocado, sliced bell peppers, fresh cilantro. 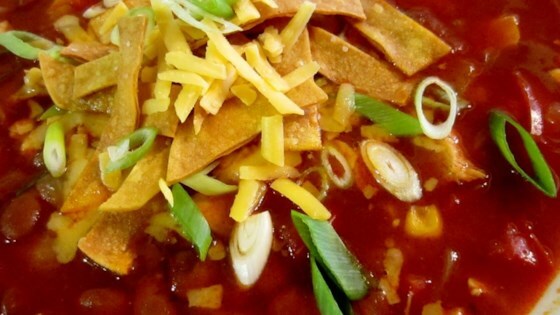 This recipe is a healthier version of Slow-Cooker Chicken Tortilla Soup.